Delicious natural strawberry and lemon flavors. Arthritis and joint pain are serious conditions that will affect at least half of the population by the age of 85 years. It may be in the form of osteoarthritis, rheumatoid arthritis, symptoms from obesity, gout, lupus, or even fibromyalgia. An estimated 52.5 million adults in the United States alone have been diagnosed as having one of these conditions, with an estimated 67 million expected to be diagnosed by 2030. This is in addition to those experiencing reduced motility, decreased flexibility, and joint pain upon normal and strenuous activities or exercise. Arthritis, specifically, is a form of joint disorder characterized by inflammation of the joints. There are two main types of arthritis: osteoarthritis and rheumatoid arthritis. Osteoarthritis is a degenerative disorder that breaks down the joint cartilage and underlying bone. This can cause joint pain and stiffness, with symptoms occurring initially following exercise but becoming constant in the long term. Rheumatoid arthritis, on the other hand, is an autoimmune disease that carries with it detrimental side effects, such as pain, stiffness, and swelling in the joints. Severe damage may also result from this progressive disease. It afflicts more than 1.6 million Americans, with the vast majority being women. Flex was designed to address both the symptoms and the main underlying cause of joint pain: inflammation. It was designed with an anti-inflammatory natural ingredient in order to address the primary cause of joint pain and swelling; however, it contains a second ingredient to reduce the joint pain itself while increasing motility and flexibility. This two-fold approach allows for more pronounced results for a variety of joint health concerns. “I’m feeling amazeballs this morning!!!! At age 15 I had spinal fusion surgery to correct a serve case of scoliosis. The fusion is in the lowest part of the spine, L1-l-4, just above the tailbone. Due to the fusion, my hips are consistently out of place and pop, I sleep mainly on my sides so mornings are pretty painful. Last night, at Tamara’s tasting I drank a FLEX in hopes of having an amazing morning. Proof is in the FLEX. I’m up, moving and my back and hips aren’t hurting! Thank you Javita once again for changing my life!!!!! 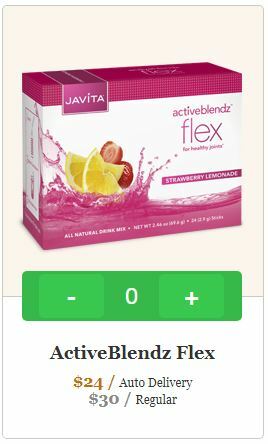 !” -Mindy G.
“I am so thankful for this New product ActiveBlendz Flex by Javita! I have experienced a lot of neuropathy pain in my legs, hands, and joints since Chemotherapy! Everyday I am feeling more relief from this amazing new drink! “I have been suffering from osteoarthritis for the past 4 years. The pain I have is mainly in my hips, knees and my hands. Depending on the weather these areas will flare up. When I drink my FLEX, the inflammation in the joints go down quite a bit. Since I take a blood thinner, my medication is limited this is why drinking FLEX works wonders for me. Thank you Javita!” ~Cheri D.
“I recently had a MRI that showed disc on nerve, and I was barely able to walk for 2 weeks due to pain. I also have severe neuropathy from Cancer treatment. I began drinking Flex as soon as it came out. I am happy to say I am walking better and feel pain free! 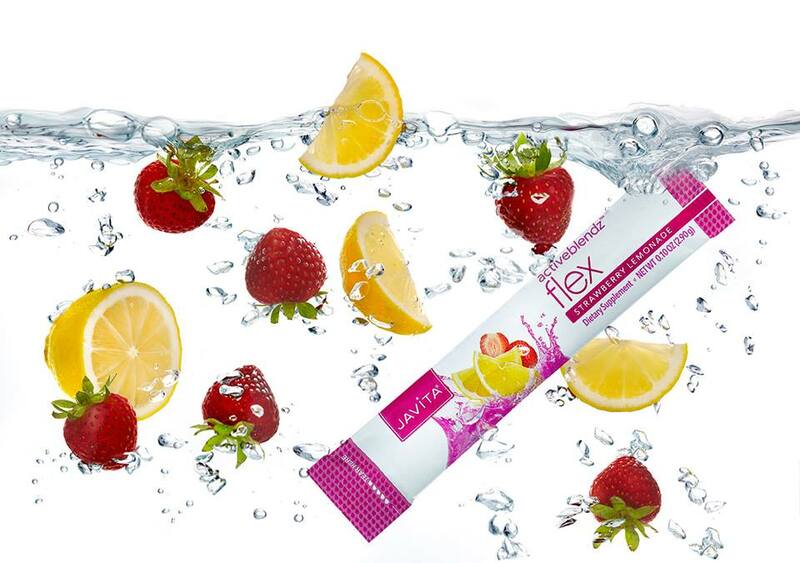 Thank you Javita for the research that went into Flex!” ~Lisa H.
“I absolutely LOVE this product!! I started drinking Flex the day it was released, and I found from just 1 a day my body has totally loosened up and taken away 10 years of stiffening joints! When I use to wake up in the morning, it took me a good 15 minutes to be completely mobile from my ankles, knees, hips etc,. Now I wake up have a great stretch from head to toe and am ready to go. No more cracking and slowly moving. Thank you Javita, Flex really works and I love it.” ~Melanie M.
“Before Flex, Carter experienced painful leg cramps that stopped his active play and woke him up at night in tears. I’m so thankful we found an all natural way to reduce inflammation, increase his mobility and take away his pain!! 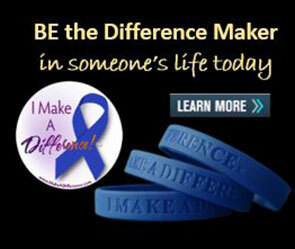 I’m one thankful momma!” ~Genevieve E.
“My entire life, I have beaten up my body. As a young kid, I was actively into skateboarding (semi-pro). During that time, I broke both wrists several times and battered and bruised myself because I felt indestructible. Then, if that wasn’t enough, from late teens to late twenties I moved on from skateboarding to ATV riding. I rode race bikes and loved to ride hard and do tricks. Obviously, this was not good for the body. I still had the mentality that I was indestructible. Well now into my late 30’s my body has had enough. I woke up every morning with cricks and cracks from every joint in my body. Then, early 2015 I hurt my back, just by picking up a garbage can. Went to the doctor to find out that I am not indestructible. I had blown out L4 and L5 in my back and needed surgery. November 11, 2015 I went into surgery. Recovery was slow and painful, but then in December 2015 my wife came home with this product “Javita Flex” and she want me to try because she said it would help with my joints. As a man, of course, I was skeptical, plus she had tried to give me other products before for my aches and pains but none of them worked. But to make my wife happy, I went ahead and tried it. After 3 or 4 days of taking the activeblendz Flex, I was really noticing a difference. My cricks and cracks were not so noticeable anymore and my lower back pain was less intense. “I’ve had issues with severe arthritis since I was 17, and now I’m almost 22 and have hardly any cartilage left in my knees so I’m sure you can only imagine how much worse it’s gotten. That being said, I was on medication BUT had to quit when my insurance ended. Ever since, I’ve been searching for something to help. I had days where I can’t even walk let alone MOVE. BUT I’ve been drinking FLEX since about the middle of September, and have actually felt that best I’ve ever left. As a 21-year-old, you don’t expect to not be able to chase your 8-month-old like someone way older than you can. I was always so upset that other people could stay chasing little man while I had to sit and watch. Well thank you Flex, because now I’m better than ever and RUNNING full speed after my little wild child! I’d still be so lost and sad without my FLEX! Plus medicine is not even needed anymore which is the second best part right after being a super mom.” ~Crystal C.
FACT: 67 million adults (1 in 4) are projected to be affected with doctor-diagnosed arthritis by 2030. How you care for and protect your joints today matters. Discover the swelling r educing, joint health supporting power in ActiveBlendz Flex. Pain relief never tasted so good. “About three years ago I was diagnosed with psoriatic arthritis after noticing pain in some of my finger joints. As is custom, I was prescribed medication. I have issues with my lower back (great for the golf game) and a separated shoulder as well. In the last 30+ days, I’ve been adding ‘Flex’ to my water. Currently I’m experiencing little to no pain. Could this be any easier? NO!” David T.
The science for ActiveBlendz Flex is sound, but what gets us really excited are notes like this about the difference each little packet is making in the lives of our Members and Customers. Finally, pain relief and joint health never stated so good! 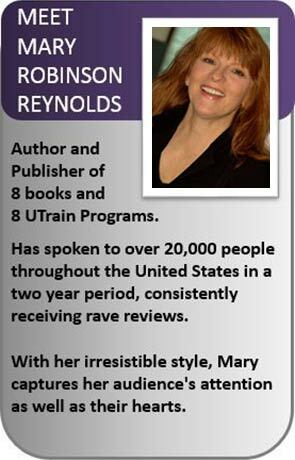 “My husband played college basketball till he suffered knee & joint pain years ago. Coupled with his profession as a Manager Sushi Chef, better days are rare as far as shoulder, knee & joint pain are concerned. “I had ACL reconstructive surgery on my right knee over a 1 year and a half ago, I had torn my ACL in half. Always had inflammation problems and stiff joint. Started drinking the Flex and it was answer to my prayers!! Knee therapy going smooth back at the gym and cycling! “I had numbness and tingling in my hands from my diabetes and was taking a horrible drug. Since I started drinking Flex, the numbness and tingling are 99% gone and I no longer take the horrible drug! Flex also allows me to walk 6000 steps in my pool each day before flex I couldn’t even walk 500 steps. Michael thinks he’s not a tough guy, but he really is. He never complains. So WE made a plan to start cutting back, and he started drinking the FLEX once a day as he slowly decreased two of the three things he takes daily. Just decreasing a dose or two a day I COULD SEE A DIFFERENCE right away! He bumped the FLEX up to 2 a day and within 4 weeks as of tonight…. completely off two highly addictive pain meds. He is down from 16 pills a day to 2. He feels so much better and he is dealing with the withdrawal symptoms ok. He says the flex seems to help with those and that’s why he drinks twice a day. 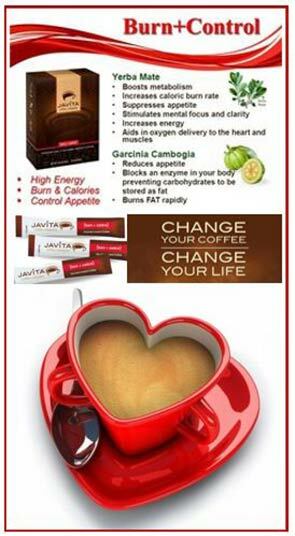 “I just wanted to share how amazing Javita Flex is. My son Nathan sprained his right wrist last Wednesday in school. The school nurse advised to immobilize it first. So we bought him a Splint wrist brace. He’d been in so much pain that I considered taking him to the hospital for an X-Ray. My mom who is in her Mid 60s called me and said that since she has been drinking FLEX she hasn’t had to use her joint cream for her knees and she hasn’t had any pain!! How cool is that!! Thought I’d share! She is so cute she sent me a commercial style picture! My name is Cristina Ekholm. I am 32 years old, a Licensed and Board Certified Massage Therapist, and have a background in nursing as well. I currently work as a Massage Therapist and own my own massage business. My husband and I have been married 9 years and have 2 beautiful daughters, 8 and 2, and live in Osceola, Wisconsin. My story began 20 years ago when I was in 7th grade. It was October, 16, 1995, it was a typical school day for me. Half way through my day, I got the worst headache of my life (or so I thought at that point). I ended up leaving school right after lunch and going home and throwing up 3 times due to the pain and severity of the headache. When I got up the next day the headache was still there and I had new symptoms, the worst throbbing, aching pain through my whole body and extreme fatigue. The next day when I woke, it was all still there and the next day, and the next day, etc. Two months after the headaches started I was diagnosed with chronic everyday headaches by a Children’s Neurologist at St. Paul Neurology. Just so that I am clear, these headaches are not tension headaches, migraine headaches, or cluster headaches. The headache is there all day every day and no one knows why. At that point, I was put on several different types of medications, had many, many tests done, including blood work, allergies, CT scans, MRIs, and even a spinal tap. I also saw many different doctors and specialist. Medications did not help, all the tests done came back with no answers, and doctors were puzzled. By this point, I was very frustrated as well as my family. I was missing tons of school. There were a lot of days I couldn’t even get out of bed due to being in so much pain and feeling like all my energy and life had been sucked out of me. And on top of this, I was not sleeping at night. I could sleep 12 hours a night and get up the next morning and not feel like I slept an hour. People and even some of my family thought I was crazy and that this was all in my head, which frustrated me even more. I became depressed. There were a lot of days I told my mom to put a gun to my head and pull the trigger because I couldn’t take it anymore. Two years later, in 9th grade at the age of 14, I was diagnosed with Fibromyalgia. This helped give me some hope, because I finally had a name to go with what was plaguing me, but still didn’t explain where the everyday headaches were coming from. I began seeing a Rheumatologist, and was put on a bunch of other medications that did absolutely nothing. I tried to get up and get moving like the doctor said, but it hurt like hell. Imagine your muscles throbbing and aching, and then they feel like they are being pulled and ripped off your bones while being stabbed and hammered with nails, and then add a huge, nauseated headache on top of all that, plus, not being able to sleep. I was told by my doctor for years that I would never be successful in life because I was too lazy, had no drive or motivation to do anything and I didn’t want to do anything. From the time all this started till I was 17, I was home schooled. I missed out on a lot of activities and events with friends and family. I did have a job and missed a lot of work as well. I was still depressed and frustrated. My mom, dad, and 2 sisters felt completely helpless. My mom missed a lot of work. I isolated myself to my room most the time and kept to myself. Before beginning my senior year of high school, I finally decided that the headaches and Fibromyalgia were not going to control my life any more. I wanted to go to Nursing and Massage school. I knew this would not be easy, but I had to do it for me. I started weaning myself off all medications. I became more active and yes, it hurt like hell, but I did it. When my senior year of high school came, my mom enrolled me in an Alternative Learning Program for school. I also became my great grandmother’s caretaker during this time, as well as working a job. I graduated high school early and was enrolled in nursing school the following fall. Since then, I graduated Nursing and Massage school. This was a challenge, extremely hard, and difficult to say the least, but I did it! Along the way, there have been good days and bad days. 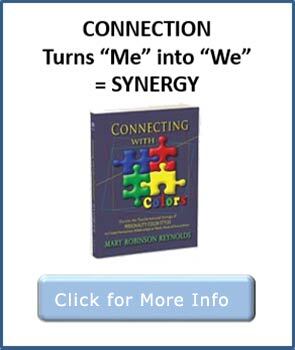 I learned to control my symptoms as best I could with diet, exercise, massage, chiropractic, and knowing my triggers. No doctors and no medications. The headaches and widespread throbbing pain through my body is still there all day every day, as well as sleepless nights and chronic fatigue. I typically would miss 3 to 5 days of work a month due to the severity of pain and the headaches as well as being an active parent in my children’s life during that time. My husband would have to take on double duty. My mom would come and take care of my kids and I when needed while my husband was at work. This made me feel guilty and frustrated because I couldn’t do my share and be a wife or a mother. I learned to accept the fact that this was my way of life because in all reality, I didn’t know any different. So, I just learned to deal with it the best I could. In November 2015, I was introduced to Javita and my life changed again. I have to admit I was very skeptical at first. But then, I tried the Flex and less than 30 minutes later, I felt some relief. In all the things I have done and tried over the years, nothing worked like this. My headaches were a lot better as well as my chronic, throbbing pain in my body. I didn’t feel like my muscles were being ripped off of my bones. I was taking Flex every day and it helped. 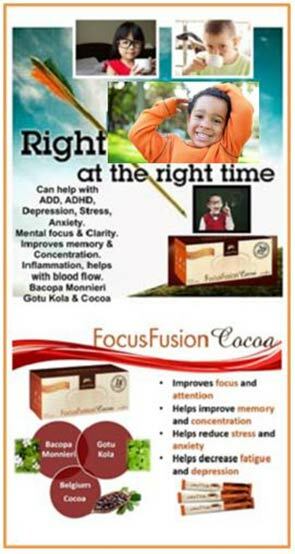 Then, I went to a Super Saturday event in January 2016 in Bloomington, MN and heard Katie’s story and how she was drinking the FocusFusion Cocoa to help with her headaches. That day I came home and started drinking the cocoa as well. 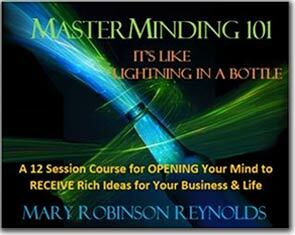 Within 2 days, my headaches and throbbing pain in my body was almost down to nothing. I have way more energy and am feeling the best I have felt in 20 years. Plus, I am sleeping a lot better at night and get up in the morning and feel rested. I continue to drink the cocoa every morning…I mix it in with my chocolate protein shake for breakfast. 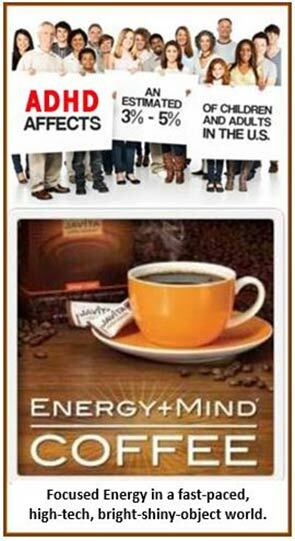 I have come to love the Energy +Mind coffee as well, and it helps me in the same way as the cocoa. I never drank coffee before, but I love this stuff. If I feel a headache starting to creep up on me during the day, I take a Flex and within 20 minutes it takes that headache right back down to almost nothing. Javita has been the miracle in my life I have been waiting for. It has not just changed my life, but my family’s life as well. Since drinking Javita, I have not missed one day of work or one day in my children’s life. I am thankful, blessed, and honored for Javita being a part of my life. Thank you to all those who made this possible in my life. Go Javita! I remember two years ago, when I had to work really, really hard to force myself to take the 150 step walk around my apartment building, and friends and my ex bf had to help me walk my dog, Sasha, because my mobility was so incredibly limited. After multiple falls due to POTS syndrome and a hospitalization because of heart concerns, I was feeling defeated at 32 years old. I’ve attached a count from my fitness tracker. I’ve reached this many steps (or more) for quite a while now, without actually trying. Over 6,000 steps regularly with zero effort, versus 150 steps that required me to take a lengthy break and do ankle exercises. My life has become more active, because my health and wellness have improved so significantly. In the summer of 2015, I had to stop my doctoral program, because I couldn’t walk from handicapped parking to my class on the second floor about a quarter mile away. The debilitating pain from fibromyalgia, and partial paralysis in the left half of my body due to the repeated falls, made getting out of bed and going to work to do my job that I love, often an insurmountable task. I found myself withdrawing from everything I enjoyed doing, the people I love, and in constant conflict because I was in so much pain. Now I find myself walking extra, to everywhere, as often as possible, and rarely sitting down. My tv time has decreased, my time spent online has decreased, and I feel HAPPY almost all of the time. I’ve been keeping up with my friends’ two little toddlers (2/4), by taking them on puppy walks and swimming while I’ve been helping out with babysitting this summer. I tried my Javita products to lose weight, but I gained my life back, and I’ve not felt this confident in myself for at least three or more years. My confidence doesn’t come from having lost a crazy amount of weight, but from overcoming what I thought was a life sentence of a sedentary and pain-filled life–from requiring a handicapped parking placard at 33 years old. I wake up in the morning, and I just get out of bed, eager to do what I need to do. Most days, I only drink the coffee, because I like the taste of it in my protein shake, and not because I need the caffeinated pick-me-up I used to crave from other coffees. The only fatigue I’m feeling, is because I’ve been going non-stop since I’ve awakened every day. The first picture is me on the first day of grad school for my doctorate. I donned an ankle brace for more than 16 months (yes, that’s accurate) starting in early November 2014 until April of 2015. At that point I just stopped wearing even my small ankle brace, because I was tired of hearing about how long I’d been wearing it. The second picture is me after using Javita for only five-six weeks, on New Year’s Day of 2016. It was the first hike I’d been able to take in more than three years. It was a beautiful moment for me to get back a piece of my soul by having the strength to commune with nature and be in the mountains. I honestly hiked to my favorite cove on the trail, listened to the wake of the boats crash to the shore, and cried tears of gratitude for getting my life back. Despite my progress, after that New Years Day Hike, I still had a fibro flare that lasted several days. Now, after using Javita products for the past seven and a half months, it has officially my been at least two full months without a major flare-up. That’s incredibly significant, because from December 18, 2015 until Spring 2016, I was down at minimum three days per week with fibromyalgia pain that was so intrusive, even showering was difficult on those days. Javita’s FLEX was a complete game-changer for my life, and I was able to eliminate all pain medicine from my fibromyalgia maintenance regimen. I went from more than a dozen prescriptions monthly, to two, one of the remaining is a lifelong anti-coagulation treatment. Some of the medications for instance my migraine medicine, I’d been on for at least seven years. 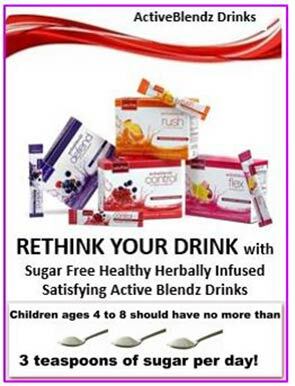 I honestly cannot believe how dramatically my entire life has changed, just because I changed what I was drinking. The mental acuity I’ve gained from being out from under so many prescriptions is absolutely astounding. I had no idea that by asking a long-lost college friend about “delicious weight loss flavored water” on Facebook, I would not only reconnect with friends all across the country, but that I would get all of my product free every month, and make additional income as well. Javita has a lifelong customer/member in me. 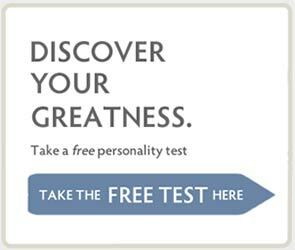 If the secret to feeling joyful, capable, confident, clear-headed, and active is drinking my Javita products, well, honestly–I’m never going to stop. I’m so thankful that Javita put the life (vita) back into me. It’s great to feel my own age again, instead of feeling like a much older, broken-down, jalopy-version of myself. Blessings come in surprising ways. In my case, it’s in what I drink. I feel exuberant. Boswellia (boswellia serrata) is a tree gum resin that has multiple health benefits. Also known as frankincense, it has been burned as incense in religious and cultural ceremonies for centuries. In today’s alternative health world boswellia is widely regarded as a potent anti-inflammatory nutrient, wherein its primary active ingredient, acetyl-11-keto-β-boswellic acid (AKBA), inhibits the inflammatory enzyme 5-lipoxygenase. Excess 5-lipoxygenase is common in joint pain, allergies, respiratory conditions, and cardiovascular problems. A number of new studies give insights into boswellia, a unique nutrient, even expanding its potential usefulness. Managing pain and inflammation without the adverse side effects of prescription and OTC drugs is one of the great advantages of nutrition. The standardized extracts of Boswellia—an herb with a long medicinal history—offers one of the top choices in this regard. A human clinical trial with knee osteoarthritis confirms the benefits of Boswellia for joint health. Another study confirms its ability to disband problematic germ gangs. A number of studies demonstrate its anti-inflammatory benefits in a variety of health situations. The knee osteoarthritis study was a double blind, randomized, placebo controlled 90-day study involving 60 people. It tested two different standardized Boswellia extracts, both of which were found to produce statistically significant improvement in pain and joint mobility. The association of joint pain and obesity is a common finding. Researchers now know that it isn’t just the extra weight causing mechanical wear and tear. There appear to be common inflammation mechanisms causing both joint destruction and obesity. One emerging culprit is excessive amounts of lipopolysaccharide (LPS). LPS is generated as bacteria sheath off their outer wall. Overweight individuals typically have imbalanced digestive bacteria making larger-than-normal amounts of LPS, which enter the general circulation and trigger inflammation, including joint inflammation. Another new study shows that boswellia can directly attach itself to toxic LPS, preventing the LPS from doing anything inflammatory. This is a novel way that boswellia reduces inflammation and is of particular value for individuals who are overweight and experiencing joint pain. We are now in an epidemic of type 2 diabetes. Interestingly, many people who persist in this condition also develop type 1 diabetes, because their pancreas gets too inflamed and tired out from having to try to make insulin all the time. Another recent study shows that boswellia was able to prevent the rise in blood sugar due to toxin-induced type 1 diabetes. Boswellia protected the insulin producing cells in the pancreas from damage. It reduced a number of inflammatory messages, including two of the most common that are elevated when a person is overweight (IL-6 and TNFa). This study supports the idea that boswellia can help protect the pancreas. In an animal experiment of intentionally induced free radical damage, boswellia reduced the amount of damage in the liver by 80 percent and in the heart by 50 percent. The researchers demonstrated potent anticoagulant properties, significantly reducing platelet aggregation. Preventing your blood from getting too sticky is vital to healthy circulation and stroke prevention. Boswellia not only lowers factors in your blood that promote stickiness, but it also has a direct impact on the rate of clotting. In this study it extended the prothrombin time on par with heparin. This study supports the use of boswellia as part of your blood health team. One of the hot topics in cancer research is the subject of epigenetics. Epigenetics deals with the topic of how genes are expressed, rather than a true genetic malfunction based on a change to the DNA sequence. Researchers studying epigenetics now realize the power of environment and nutrition to influence gene function and thus cancer risk. New research shows that boswellia is another nutrient that can influence epigenetic function. Working with colon cancer cells researchers found that boswellia changed epigenetic function so that tumor suppressor genes started functioning again. “About three years ago I was diagnosed with psoriatic arthritis after noticing pain in some of my finger joints. As custom, I was prescribed medication. I have issues with my lower back (great for the golf game) and a separated shoulder as well. In the last 30+ days, I’ve been adding ‘Flex’ to my water. Currently I’m experiencing little to no pain. Could this be any easier? NO!” -David T.
Hershey Maclang Gonzales: After working 12 hour shift 3x week Walking & standing. I have pain on my right leg. Can’t even walk down the stairs properly also limping at the end of the day…FLEX is the only one helped me!!! No more Pain….Thank you Javita. Julie’s Flowers: Oh it works!! My mother and 82 years old client is still amaze with it!! Joey Gruet: My Mom just had surgery to remove a tumor on her left kidney caused by use of insulin for years. She’s suffering from Sciatica, because of her condition i didn’t want to give her any OTC painkillers. Instead i gave her FLEX! it helped her rid of the back pains down to her limbs. She’s also taking DEFEND to control her blood sugar. Thanks! A staggering 53 million Americans suffer from arthritis, making it the leading cause of disability in this country. A nutritional compound has demonstrated the ability to address one of the root causes of joint pain—reducing pain and improving flexibility—with none of the side effects of typical drug treatments. Called “natural collagen concentrate,” (NCC), this protein compound acts against the autoimmune reactions that can lead to joint pain and degeneration. NCC has been shown effective in previous animal and human studies of arthritis. A groundbreaking new study shows that NCC can reduce joint pain and improve joint flexibility even in healthy people who experience painful joints after exercise. While the term “arthritis” can be used to describe several different conditions, the two most common forms are osteoarthritis and rheumatoid arthritis. Rheumatoid arthritis is an autoimmune disease in which the body reacts to components in joint tissue (mainly collagen) to produce inflammation, pain, and disability. Osteoarthritis was traditionally thought to be the result of wear and tear on the joints.10 Recent discoveries, however, have determined that osteoarthritis is accompanied by the same pro-inflammatory immune factors involved in rheumatoid arthritis. In both conditions, an autoimmune response is caused when the body launches an attack against collagen, the substance that makes up the bulk of the cartilage that lines your joints. Collagen is a protein critical to reducing friction and keeping joints youthful. The problem occurs when microscopic bits of collagen find their way into the bloodstream, at which point immune cells mistakenly identify them as invasive, foreign molecules. In response to this perceived “threat,” inflammatory cytokines are released that draw in more“killer” T-cells. Those cells bombard exposed cartilage with toxic chemicals in order to destroy it, creating oxidative stress and further inflammation in the process. Over time, these continuous attacks erode and disintegrate the cartilage that lubricates and functions as a shock-absorber in joints. The resulting pain can become chronic and debilitating, and can include sensations of friction or grinding involved in joint movement. While less acute at rest, this pain is exacerbated by walking, standing, or any form of weight-bearing. Osteoarthritis sufferers often experience joint stiffness or immobility after periods of inactivity. Fortunately, scientists have discovered a substance called un-denatured type II collagen, or NCC, that retrains killer T-cells so that they recognize collagen as a harmless substance—preventing the joint damage seen in osteoarthritis. NCC was discovered when a team of scientists at the University of Nebraska found that chicken soup prevented the mobilization of immune system cells to sites of inflammation. Upon further analysis, they discovered that it was not vegetables, but a component of the chicken broth itself that exerted this anti-inflammatory activity. The researchers showed that chicken-derived type II collagen functions to regulate the immune system so that it stops attacking proteins normally found in healthy joint cartilage. In a pilot study of people with severe joint pain, a dose of 10 mg/day of this type II collagen (NCC) for 42 days was shown to significantly reduce joint pain and swelling, along with morning stiffness, stiffness following periods of rest, pain that worsens with use of the affected joint, and loss of range of motion and function. Follow-up studies show NCC reduces joint pain and stiffness that can follow as a result of exercise. Even normal exercise puts stress on joints, which causes the release of collagen fragments into the bloodstream. Since these fragments are partly to blame for post-exercise pain and stiffness, supplementing with NCC can prevent post-exercise pain. Extensive animal studies have been carried out on the effects of NCC in various kinds of arthritis—especially in horses and dogs, two species in which arthritis is common. After 90 days on a 10 mg dose of NCC, obese arthritic dogs showed significant decreases in overall pain, in pain during manipulation of a limb, and in lameness after exertion. Longer-term studies have shown that after taking NCC for 120 days, animals experienced a 62% reduction in overall pain, a 91% reduction in pain caused by limb manipulation, and a 78% reduction in exercise-associated lameness. No ill effects or adverse events were seen in any of these studies. Evaluation of NCC in arthritic dogs has been carried out using a high-tech, piezo-electric ground force plate that measures how much weight the animal is putting on each limb and how hard the animal is able to push against the ground as it walks. These studies showed that NCC-supplemented dogs had significant improvements in both measurements, demonstrating a reduction in arthritis-related pain. Horses given NCC treatments experienced similar benefits. In one study, horses given placebo treatments showed no change in symptoms attributed to arthritis, while the horses given NCC treatments experienced an 88% reduction in overall pain and a 78% reduction in pain caused by limb manipulation. Again, the treatments were well tolerated and free of side effects. Scientists have now discovered that both osteoarthritis and rheumatoid arthritis are caused when the body launches an autoimmune attack against exposed fragments of collagen. Un-denatured type II collagen,” or “NCC”, is a protein supplement that acts against the autoimmune reactions that can lead to join pain and degeneration. Animal and human studies convincingly demonstrate that induction of oral tolerance with NCC reduces pain and improves joint function in osteoarthritis and, more recently, in people without arthritis but who suffer joint pain and stiffness following exercise. NCC is safe and well tolerated; it should form part of every serious joint health program. Human clinical trials of NCC demonstrate similar effectiveness in adults suffering from osteoarthritis. In one study, patients with knee osteoarthritis received NCC or standard treatment for 90 days. The supplemented group experienced a 33% reduction in their osteoarthritis compared to standard therapy recipients. NCC reduced the patients’ self-determined pain scale scores by 40%, compared with just 15.4% in those receiving standard care. And NCC improved joint function by 20%, compared with 6% for usual care. Of course, arthritis is just one of many causes of joint pain, which is why researchers in California recently conducted a study of oral NCC in healthy adults who did not have arthritis. These subjects had no knee pain at rest, but reported significant knee pain after exercise. The patients underwent a similar exertion test at each of 7 visits over a 120-day period. Compared to their performance at the beginning of the study, by days 90 and 120, the subjects that had supplemented with 40 mg NCC could exercise for significantly longer before experiencing joint pain; no such changes were seen in the placebo group.4 Supplemented subjects recovered from their joint discomfort significantly faster than the placebo recipients at days 60, 90, and 120. The same new study evaluated joint flexibility and determined that the average knee extension was significantly greater in the NCC group than in the placebo group at day 120. Importantly, NCC recipients had significant increases in their knee extension compared to their own baseline level, with no such changes seen among placebo recipients. The broad-spectrum safety of NCC has been evaluated by a number of toxicological assays. It causes no mutations in bacterial genomes, a standard screen for carcinogenicity, and is not associated with oral toxicity. NCC works through something called oral tolerance, which is the desensitization of immune response to specific agents via an orally administered intervention. In this way, NCC reverses T-cell attacks on exposed cartilage. This makes sense, considering that when researchers want to produce an animal model of human arthritis, they inject small quantities of collagen. The immune system responds by ramping up production of cells that react to collagen. Those cells then attack normal, healthy joint tissue, producing symptoms and signs of arthritis. Remarkably, however, if the animals are first given a small oral dose of collagen, the incidence of experimentally induced arthritis plummets. And the severity of joint disease is reduced in the animals that do develop arthritis. This phenomenon, called “oral tolerance,” relies on what’s known as gut-associated lymphoid tissue. Clumps of this tissue are found in the human intestinal tract; they are instrumental in “presenting” the oral collagen fragments to the immune system, which then suppresses its response to the protein. Oral tolerance has other benefits as well, including fighting food allergies through careful exposure to the offending foods. A similar methodology is under investigation for boosting the immune response to certain cancers, especially those of the intestinal tract (mushroom extracts are used there). Pre-treatment with NCC , in other words, may be inducing immune tolerance even in healthy adults, protecting them from deleterious exposure to their own cartilage. We don’t react to our own cartilage normally because, in intact joints, there’s a barrier between blood and cartilage so that immune system cells in the blood don’t “see” cartilage proteins. In the aging joint, this protective barrier between blood and cartilage diminishes. NCC offers a different approach to modifying joint inflammation rather than simply masking the symptoms. Arthritis leads the list of conditions that cause disability among American adults. Standard medical treatment consists mainly of treating the symptoms, with few tolerable drugs that modify the course of the disease. A low-cost nutritional supplement has the ability to address the root cause of joint pain—reducing joint pain and improving flexibility. Called “un-denatured type II collagen,” or “NCC,” this natural protein supplement acts against the autoimmune reactions that can lead to join pain and degeneration. NCC has demonstrated efficacy in animal and human studies of arthritis—and can even reduce joint pain and improve joint flexibility in healthy people who experience painful joints after exercise. The implications cannot be overstated; the ability to move comfortably and engage in regular physical activity is critical to maintaining health in the face of our national epidemic of obesity, diabetes, and cardiovascular diseases. Not all collagen is equal in its ability to fight joint pain. There are two types of collagen: denatured collagen (collagen that’s been disrupted by heat or chemical treatment) and undenatured collagen. An experimental model of autoimmune arthritis showed that “denatured” collagen had no effect on the incidence or severity of the disease. But the specially-processed undenatured type II collagen (NCC) is more effective because it’s uniquely designed to preserve the 3-dimensional structure of type II collagen. Immune cells in the intestine rely on 3-D shapes to recognize and respond to the signals that turn them on or off. NCC provides the correct 3-D structures to intestinal immune cells, triggering the signaling required for the development of immune tolerance. A nutritional compound (featured in ActiveBlendz Flex) has demonstrated the ability to address one of the root causes of joint pain—reducing pain and improving flexibility—with none of the side effects of typical drug treatments. Called “un-denatured type II collagen,” or “UC-II®,” this protein compound acts against the autoimmune reactions that can lead to joint pain and degeneration. UC-II® has been shown effective in previous animal and human studies of arthritis. A groundbreaking new study shows that UC-II® can reduce joint pain and improve joint flexibility even in healthy people who experience painful joints after exercise. While the term “arthritis” can be used to describe several different conditions, the two most common forms areosteoarthritis and rheumatoid arthritis. Rheumatoid arthritis is an autoimmune disease in which the body reacts to components in joint tissue (mainly collagen) to produce inflammation, pain, and disability. Osteoarthritis was traditionally thought to be the result of wear and tear on the joints.10 Recent discoveries, however, have determined that osteoarthritis is accompanied by the same pro-inflammatory immune factors involved in rheumatoid arthritis. In both conditions, an autoimmune response is caused when the body launches an attack against collagen, the substance that makes up the bulk of the cartilage that lines your joints.1 Collagen is a protein critical to reducing friction and keeping joints youthful. The problem occurs when microscopic bits of collagen find their way into the bloodstream, at which point immune cells mistakenly identify them as invasive, foreign molecules. Fortunately, scientists have discovered a substance called un-denatured type II collagen, or UC-II®, that retrains killer T-cells so that they recognize collagen as a harmless substance—preventing the joint damage seen in osteoarthritis. UC-II® was discovered when a team of scientists at the University of Nebraska found that chicken soup prevented the mobilization of immune system cells to sites of inflammation. Upon further analysis, they discovered that it was not vegetables, but a component of the chicken broth itself that exerted this anti-inflammatory activity. In a pilot study of people with severe joint pain, a dose of 10 mg/day of this type II collagen (UC-II®) for 42 days was shown to significantly reduce joint pain and swelling, along with morning stiffness, stiffness following periods of rest, pain that worsens with use of the affected joint, and loss of range of motion and function. Follow-up studies show UC-II® reduces joint pain and stiffness that can follow as a result of exercise.4 Even normal exercise puts stress on joints, which causes the release of collagen fragments into the bloodstream.16-19 Since these fragments are partly to blame for post-exercise pain and stiffness,16-19 supplementing with UC-II® can prevent post-exercise pain. Extensive animal studies have been carried out on the effects of UC-II® in various kinds of arthritis—especially in horses and dogs, two species in which arthritis is common. After 90 days on a 10 mg dose of UC-II®, obese arthritic dogs showed significant decreases in overall pain, in pain during manipulation of a limb, and in lameness after exertion. Longer-term studies have shown that after taking UC-II® for 120 days, animals experienced a 62% reduction in overall pain, a 91% reduction in pain caused by limb manipulation, and a 78% reduction in exercise-associated lameness.8No ill effects or adverse events were seen in any of these studies. Evaluation of UC-II® in arthritic dogs has been carried out using a high-tech, piezo-electric ground force plate that measures how much weight the animal is putting on each limb and how hard the animal is able to push against the ground as it walks. These studies showed that UC-II ®-supplemented dogs had significant improvements in both measurements, demonstrating a reduction in arthritis-related pain. Horses given UC-II® treatments experienced similar benefits. In one study, horses given placebo treatments showed no change in symptoms attributed to arthritis, while the horses given UC-II® treatments experienced an 88%reduction in overall pain and a 78% reduction in pain caused by limb manipulation.21 Again, the treatments were well tolerated and free of side effects. Millions of Americans suffer from arthritis, yet medications make no real change in the course of the disease. Un-denatured type II collagen,” or “UC-II®,” is a protein supplement that acts against the autoimmune reactions that can lead to join pain and degeneration. Animal and human studies convincingly demonstrate that induction of oral tolerance with UC-II® reduces pain and improves joint function in osteoarthritis and, more recently, in people without arthritis but who suffer joint pain and stiffness following exercise. UC-II® is safe and well tolerated; it should form part of every serious joint health program. Human clinical trials of UC-II® demonstrate similar effectiveness in adults suffering from osteoarthritis. In one study, patients with knee osteoarthritis received UC-II® or standard treatment for 90 days. The supplemented group experienced a 33% reduction in their osteoarthritis compared to standard therapy recipients. UC-II® reduced the patients’ self-determined pain scale scores by 40%, compared with just 15.4% in those receiving standard care. And UC-II ® improved joint function by 20%, compared with 6% for usual care. Of course, arthritis is just one of many causes of joint pain, which is why researchers in California recently conducted a study of oral UC-II® in healthy adults who did not have arthritis. These subjects had no knee pain at rest, but reported significant knee pain after exercise. The patients underwent a similar exertion test at each of 7 visits over a 120-day period. Compared to their performance at the beginning of the study, by days 90 and 120, the subjects that had supplemented with 40 mg UC-II® could exercise for significantly longer before experiencing joint pain; no such changes were seen in the placebo group. Supplemented subjects recovered from their joint discomfort significantly faster than the placebo recipients at days 60, 90, and 120. The same new study evaluated joint flexibility and determined that the average knee extension was significantly greater in the UC-II ® group than in the placebo group at day 120. Importantly, UC-II® recipients had significant increases in their knee extension compared to their own baseline level, with no such changes seen among placebo recipients. The broad-spectrum safety of UC-II® has been evaluated by a number of toxicological assays. It causes no mutations in bacterial genomes, a standard screen for carcinogenicity, and is not associated with oral toxicity. Effects of orally administered undenatured type II collagen against arthritic inflammatory diseases: a mechanistic exploration.